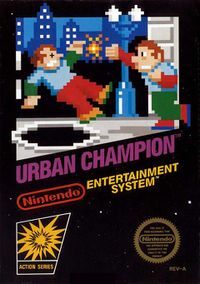 Urban Champion is a 2D fighting game developed and released by Nintendo for the Famicom in Japan in 1984, and later for the NES in North America and Europe in 1986. In North America, Urban Champion was released as part of the Action Series. The game was based on the Game & Watch title Boxing. Are you tough enough to take on the baddest guys on the block? Think you're tough, huh? Well, you better be. Because you've got to be quick on your feet and fast with your hands to become the next URBAN CHAMPION. You've got to block, fake and land punches that will knock your opponent off the screen. Do that three times and there will be a confetti celebration in your honor as you become the new URBAN CHAMPION. But watch out. Just when you think you've beaten him to the punch, you fall into an open manhole! Or get hit by a falling flower pot! Think you can handle the action? Then prove it. Play by your self or challenge a friend, either way you'll have a knockout time defeating the toughest guys in the neighborhood in URBAN CHAMPION. The mean streets have a new force to deal with: you! Don't let the big, bad bully of the neighborhood push you around! Fight for your right to walk the street. Hit him high or hit him low, but don't forget to dodge or block his punches—and watch for the manhole! If you fall, a shower of confetti will celebrate your enemy's victory... how humiliating! Avoid being taken away by the police or bonked on the head by a flowerpot in your fight to hold your head up high. You can spar with the computer bully or a friend to see who's the toughest on the block. The first fighting game released for the Nintendo Entertainment System™ returns for a knockout in amazing 3D. The first fighting game released for the Nintendo Entertainment System is back for another round. Use a combination of punches to knock your opponent backward into an open manhole before time expires. Watch out for angry neighbors who will attempt to drop flowerpots on your head. The police will also make an occasional appearance to temporarily break up the fight – or to make an arrest if time runs out. Find out if you have what it takes to make it on the rough city streets against the toughest brawlers around. Prove yourself worthy and be crowned Urban Champion. Don't let the big, bad bully of the neighborhood push you around! Find out if you have what it takes to make it on the rough city streets against the toughest brawlers around. Use a combination of punches to knock your opponent backward into an open manhole before time expires. If you fall, a shower of confetti will celebrate your enemy's victory - leaving you with your wounded pride. Watch out for angry neighbors who will attempt to drop flowerpots on your head. The police will also make an occasional appearance to temporarily break up the fight - or to make an arrest if time runs out. Spar against a computer bully or a friend and prove your worth in becoming the Urban Champion! Don't let the big, bad bully of the neighborhood push you around! Find out if you have what it takes to make it on the rough city streets against the toughest brawlers around. Use a combination of punches to knock your opponent backward into an open manhole before time expires. If you fall, a shower of confetti will celebrate your enemy's victory--leaving you with your wounded pride. Watch out for angry neighbors who will attempt to drop flowerpots on your head. The police will also make an occasional appearance to temporarily break up the fight - or to make an arrest if time runs out. Spar against a computer bully or a friend and prove your worth in becoming the Urban Champion! Re-releases of Urban Champion have generally been received poorly by critics. Craig Harris of IGN gave the e-Reader release of the game a 5.0 out of 10, stating that, "It's a nice idea, but it's not surprising that the game wasn't a huge hit." Later, IGN's Lucas M. Thomas reviewed the Wii Virtual Console release and rated it 2.5 out of 10, claiming Urban Champion to be "the worst game ever published by Nintendo," and comparing it unfavorably to the Game & Watch title Boxing, stating that, "Urban Champion's design was fine as a Game & Watch handheld in 1984, but taken to the NES it was just too shallow." Jeff Gerstmann of GameSpot gave the Wii Virtual Console release a 3.6 out of 10, stating, "This may have been a mediocre game upon its initial release, but now it's pretty much impossible to enjoy unless you're operating on some ultraironic level where you can only appreciate games if they're truly awful." NA: 1985 A direct port of the game released for the Nintendo VS. System arcade machine, for the purpose of testing the market before the NES release. Urban Champion-e Game Boy Advance (e-Reader) NA: November 11, 2002 A direct port of Urban Champion, released as a pack of e-Cards for the Game Boy Advance e-Reader. KOR: September 30, 2008 A direct port of the game, released as a digital download for Wii. JP: July 13, 2011 A 3D-enhanced port of the original game, released as a digital download on the Nintendo eShop as part of the 3D Classics line. EU/AUS: October 17, 2013 A direct port of the game, released as a digital download for Wii U with emulator features. ↑ NES games list by Nintendo. Retrieved March 13, 2017. ↑ Urban Champion review on IGN (February 15, 2007). Retrieved March 13, 2017. ↑ Urban Champion-e. IGN. Retrieved March 13, 2017. This page was last edited on 13 March 2017, at 22:31.